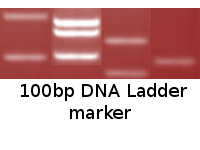 Description: The 100 bp DNA Ladder is suitable for sizing double-stranded DNA from 100 to 1000 bp. The 500 and 1,000 base pair bands have increased intensity to serve as reference points. The double-stranded ladder can be visualized on 1% to 2% agarose gels after ethidium bromide staining. Preparation: Complete digestion of MINOTECH biotechnology 100bp ladder plasmid with appropriate restriction enzyme yields the following 8 discrete fragments (in base pairs): 1000, 800, 600, 500, 400, 300, 200, 100. Storage buffer: 10 mM Tris-HCl (pH 8.0) and 1 mM EDTA. Store at -20oC. Note: Dilute in TE or other buffer of minimal ionic strength. DNA may denature if diluted in dH2O and subsequently heated.